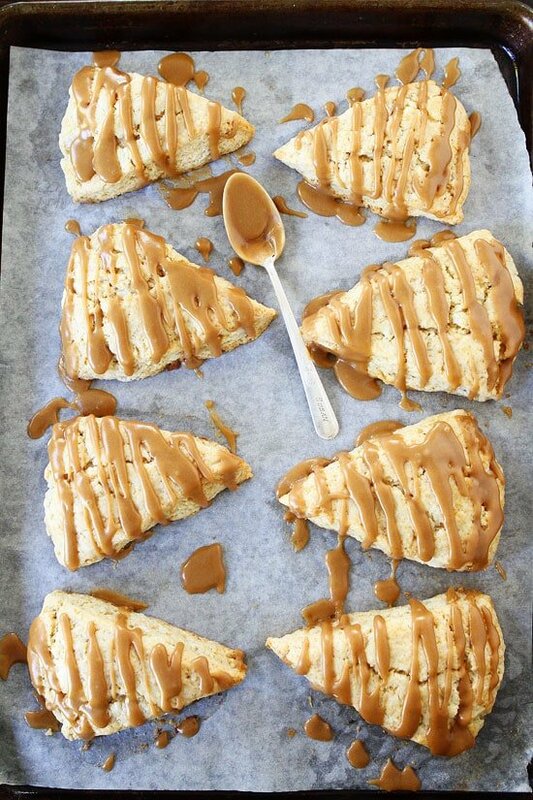 Maple Scones-tender, buttery scones with a sweet maple glaze! Top with chopped up candied pecans for an extra special scone. Over the weekend, Josh went to the store to pick up a few groceries. He came home empty handed and I didn’t smell maple. I looked at the receipt and no donut! I was shocked. I asked Josh why he didn’t get a maple bar. He looked at me with a sad face and said they were out of maple bars. Poor guy! Josh had to go back to the store to buy heavy cream to make the scones. He was determined…or maybe he was checking to see if they made any new donuts..ha! They must have still been out because he came home and got busy on the scones! The scones are made with heavy cream and butter…so you know they are going to be good! They are light and fluffy and so good with the sweet maple glaze! 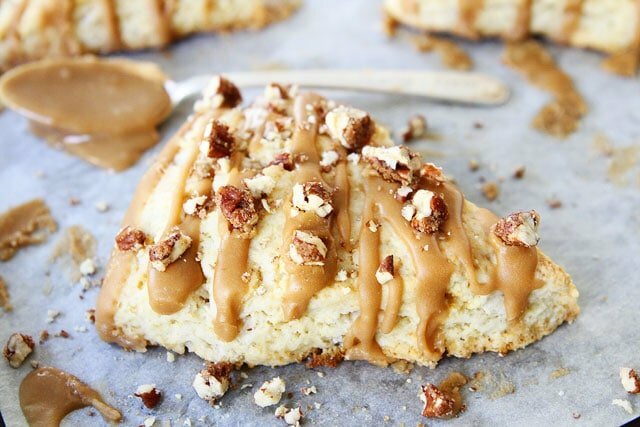 If you are a maple bar fan, you will love these scones too! Josh brought me a warm scone to enjoy while I was feeding the baby, I know I am spoiled. I took a bite and thought the scone was really good! Josh did a fabulous job. I had an idea though. 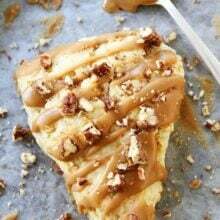 I thought Josh’s Maple Scones would be even better with candied pecans on the top. 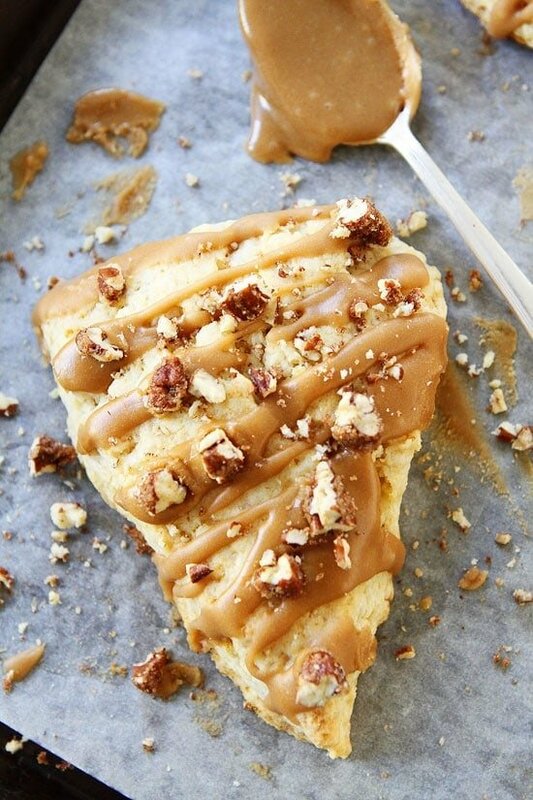 The Maple Scones are delicious…with or without the candied pecans. You decide which version you like better:) Props to Josh on creating a fabulous scone recipe. I think I need to tell the grocery store to sell out of maple bars every morning so we can enjoy homemade Maple Scones instead. They were delish! 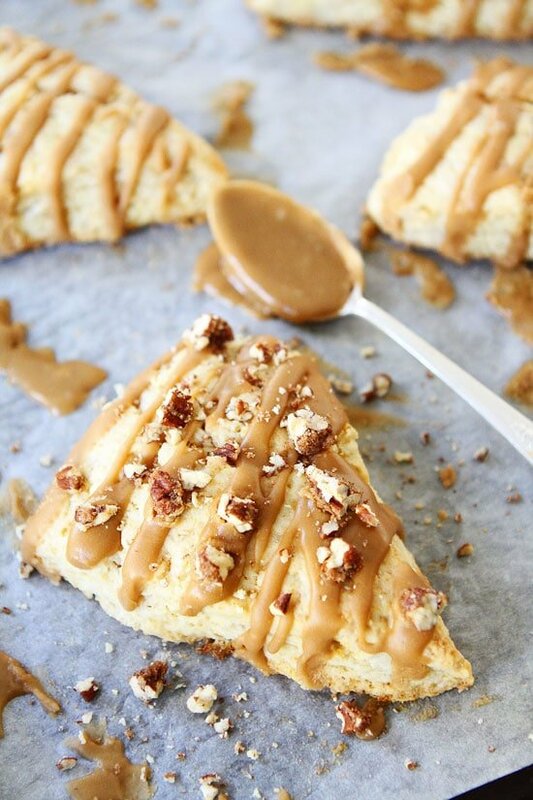 If you like maple bars, you will love these maple scones! They are easy to make at home and a wonderful breakfast treat! Preheat oven to 400 degrees F. Line a large baking sheet with parchment paper or a Silpat baking mat and set aside. In a large bowl, whisk together flour, baking powder, brown sugar, and salt. Quickly cut in the butter, using your hands, two knives, or a pastry blender. Mix until mixture resembles coarse meal, with a feel larger butter lumps. In a small bowl, whisk together 3/4 cup heavy cream, the egg, and vanilla extract. Pour the mixture over the ingredients and stir with a spatula until dough begins to form. Don't over mix. Transfer dough to a floured countertop and knead dough by hand just until it forms a ball. Form scones by patting the dough into a 3/4-inch thick circle. Cut the scones into even triangles. Place scones on prepared baking sheet. Using a pastry brush, brush scones lightly with the additional one tablespoon of heavy cream. 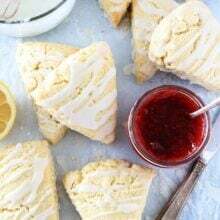 Bake scones for 15-17 minutes, or until scones are slightly golden brown. Cool scones on a wire cooling rack. While the scones are cooling, make the maple glaze. In a small saucepan, add butter, maple syrup, and heavy cream. Heat over medium until butter is melted and ingredients are combined, stirring occasionally. Stir in the maple extract. Slowly whisk in the powdered sugar, adding about 1/4 of a cup at a time. The glaze will be a little lumpy at first, but will smooth out as you keep whisking. Let glaze cool for 5 minutes. Drizzle glaze over cooled scones. Top with chopped candied pecans, if desired. Note-Scones will keep in an air-tight container for up to 2 days, but they really are best eaten the day they are made. Follow us on Instagram and show us what recipes you are making from our blog! Use the hashtag #twopeasandtheirpod! We want to see what you are making in your kitchen! These look so incredible! I could probably eat like 10. Although, I’d end up just going for the bowl of that GLAZE! Oh man, these are perfect!!! Considering I am Canadian, and Maple syrup basically runs in my veins, I am ALL KINDS of excited about these scones! lovelovelove the crunchy candied pecans on top! Hello breakfast. Pinned! These do sound yummie! I’ve never done scones, but I’m willing to try. My question, can you mix the dough with a food processor? Thanks – looking forward to making these (maybe for Thanksgiving morning)! Beautiful scones! Want one now!! Aaaghhh, these scones! I’m having a HUGE scone moment lately, and these look perfect. Love the maple glaze! 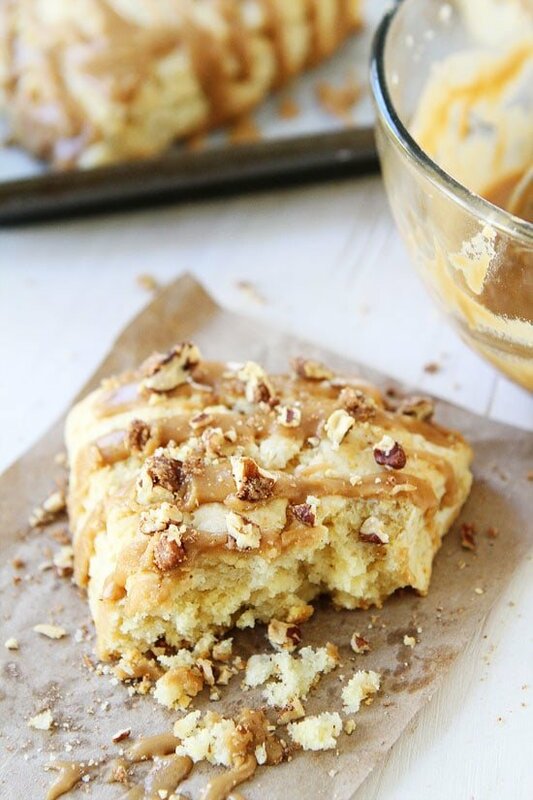 LOVE the recipe – from a fellow maple bar addict! These look like the perfect scones for breakfast!! Love! Josh and I are kindred spirits. I am a maple bar girl. Since I got the allergies, I find other ways to get my maple fix!! These scones are lovely Maria! Yum! I’ll make these during the Christmas holidays for our visiting family! I’ll top some with toasted pecans. Um, I CAN’T WAIT TO MAKE THESE!! And the maple glaze….forget about it! Yum! I’m having my morning coffee right now and this would be perfect along side. I love maple anything, so these are getting made. Josh did such a great job on this. 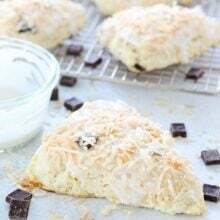 Love that maple flavor in these scones!! This looks like the best breakfast ever. Maple anything is always a hit here! Loving these scones and the glaze looks amazing! These look seriously heavenly. Maple is one of my all-time favorite flavors! I love maple scones! Beautiful photos! I can tell Josh and I would be fast friends. I’m all over anything with maple syrup. 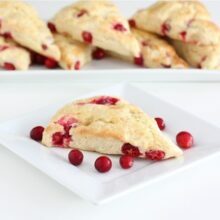 These scones look delicious! Oh super yum! I would go with the pecans too. 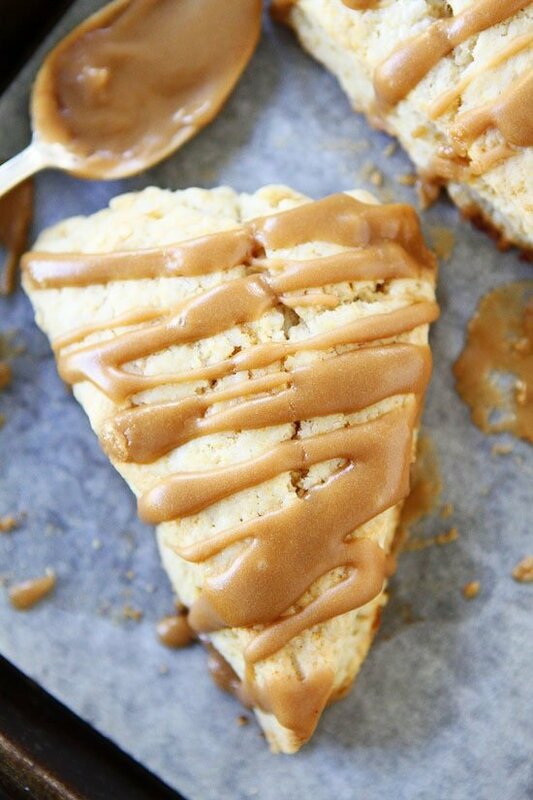 Oh my goodness I seriously love all things maple and maple scones are so so so good! Pingback: Love – Jesus Quotes | When is Jesus Coming Back? Would substituting some maple sugar for the light brown work you think? To make the scones themselves have some if that maple flavor? Rather, substituting some maple sugar for some light brown sugar, not all of it of course. These look great! As a mom of a child with serious nut allergies, I appreciate any nut-free recipe I can find, so naturally Josh’s version is the one for our family! Glad you liked the scones! Nothing can get between a man and his mission – or his craving! Ha! These look so tender and soft and the maple flavor is probably incredible! Drooling! WoW! These look so good just as they are. But my brain starts whirling and I wonder what would happen if you dipped just the top of the scone in the glaze and then sprinkled crumbled crispy cooked bacon on them? Just a thought…. I don’t have maple extract. With what I can substitute? Or can I just skip it? Best scones I have ever made. Light and buttery. I used plain pecans on top and substituted maple extract for the vanilla. I also made petite scones and baked them for 14 minutes. Mindblowingly good. The scones were a hit at our tea party. If maple is what you like these are the best, especially with the pecans. Thank you for sharing your recipe. The only slight adjustment, would make half the glazing, we had approximately half left over. A good reason I to make another batch I guess. I love scones! I make them all the time. I was so excited to find your recipe! I have them cooking in the oven right now. My dough was very wet, is that normal for this recipe? If not, what change should I make? Thank you! I’ve made these so many times and they are absolutely delicious, best scones I’ve ever had, thank you SO much! Can you use milk instead of heavy cream? Do they freeze well? 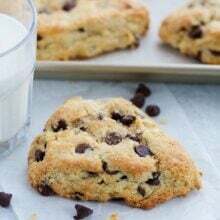 We absolutely love love these scones ..
Can I make the dough ahead of time? Planning ahead for Thanksgiving and I’m thinking of making the dough the night before and bake them the next morning. Also, if I do that should I put the dougj in the fridge all together or should I cut it first?